Bake a batch of Houndstooth Mini Cakes for an impressive Valentine Day Dinner. Dark chocolate cupcakes are filled with truffle filling and baked to perfection. Instead of frosting, black and white houndstooth edible wafer paper is added to the tops of the cakes with light corn syrup. 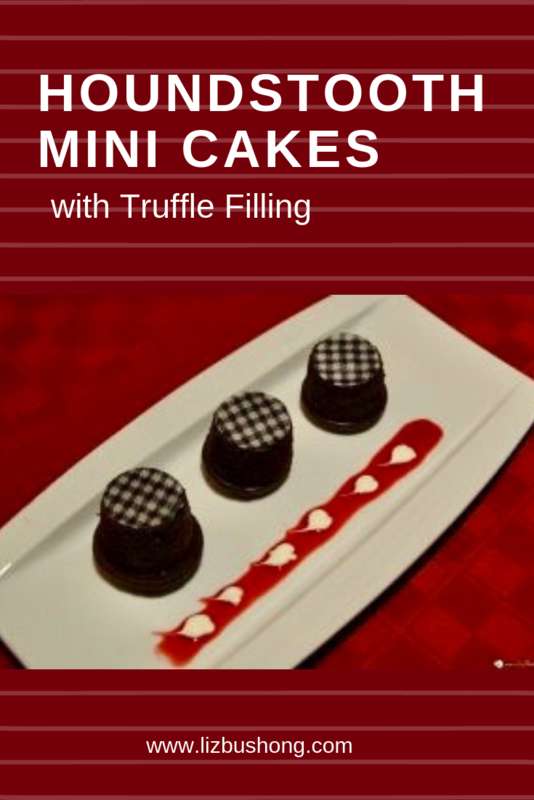 Serve these mini cakes on a white plate with raspberry coulis and sour cream string of hearts. The recipe looks long but it is worth the effort. Bake the cakes a day or even a month ahead and freeze to keep fresh. Before serving the cakes, thaw cakes and add houndstooth wafer paper, then plate with raspberry sauce and string of hearts. 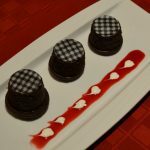 Chocolate 2″ cakes are baked and turned upside down and decorated with black and white houndstooth wafer paper and raspberry sauce with string of sour cream hearts. In glass measuring cup pour heavy cream and microwave for 20 seconds until warm, but not boiling. Add chocolate morsels & orange extract, stir to melt and has smooth consistency. Place in refrigerator to harden. Once mixture is firm, form into a 1-inch round ball. Refrigerate until ready to place in cupcakes. 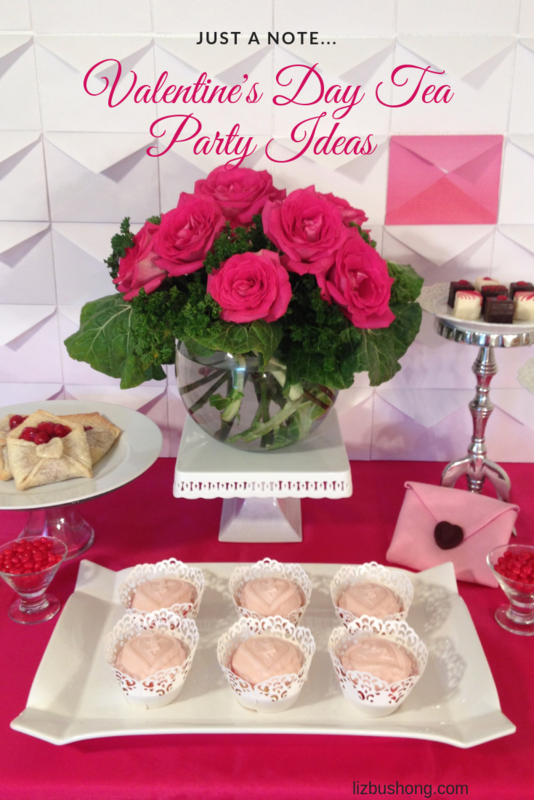 Preheat oven to 350 F. Prepare mini cupcake pan with mini liners or spray 2” mini cake pans with cooking spray. Combine first 6 ingredients. Beat batter for 2 minutes to blend. Fill plastic zip lock bag with batter, clip end of bag to ¼ – ½ “. Pipe half the batter into cupcake liners or mini 2” cake pans. Place shaped truffle into batter, then cover truffle with remaining cake batter. Bake cakes 20-25 minutes. Remove from oven. Let cool completely. You can frost or use wafer sheets for garnish. Set to Serve: Assemble cakes upside down on a white serving platter of choice. Cut out wafer paper to the size of the mini cakes, Brush cake bottoms (which are now the tops) lightly with corn syrup. Place the wafer cut outs on top of the cakes. Place three mini cakes on a serving platter. Beside the cakes drizzle a line of raspberry sauce on to plate. Drop thinned sour cream in dots on the sauce. Take a toothpick and run the pick down the center of the white cream dots to form your string of hearts design. Wafer paper comes in several designs and images. 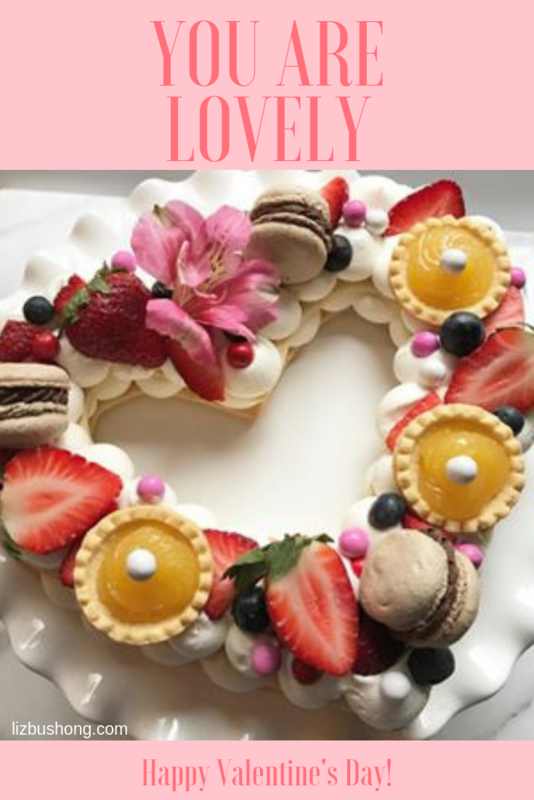 Found at Cake Decorating Shops or online. Some grocery store bakeries also carry Edible wafer paper.